Visit our sign up page and create your SparkPost account. Choose the method that works best for you. View this support article for more detailed information on setting up sending domains. There are lots of links available on the web for installing Discourse so this article won’t provide a detailed walkthrough. If you’re starting from scratch we highly recommend this article: How to use the Discourse One-Click Application on DigitalOcean. 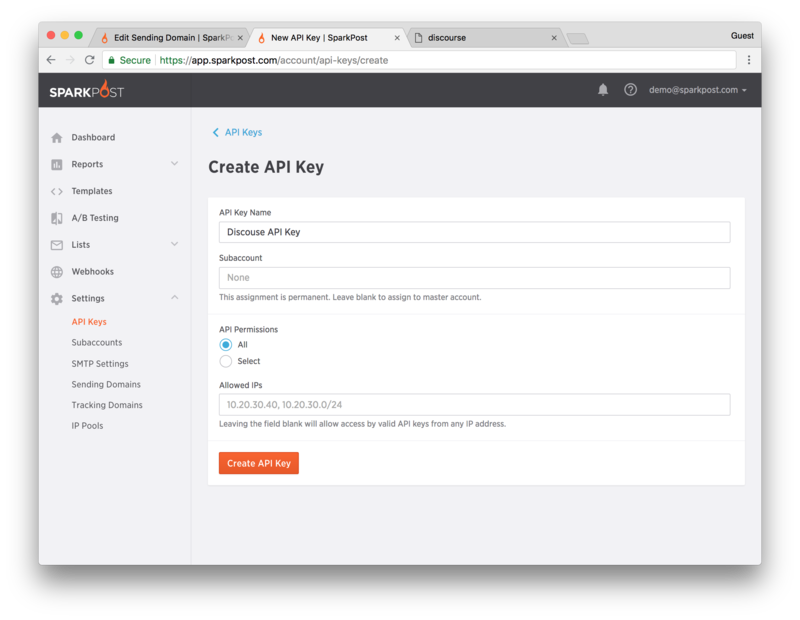 Where YOUR-API-KEY is the key you created above with the “Send with SMTP” permission. - exec: rails r "SiteSetting.notification_email=noreply@your-sending-domain.com"
- exec: rails r "[email protected]"
Note that you should replace “your-sending-domain.com” with the sending domain you created and verified earlier. # Go forth and send! Your Discourse installation should now be configured to send email through SparkPost.